Purpose (1) To quantify current practice at the most elite level of professional club football in Europe with regard to injury prevention strategy; (2) to describe player adherence and coach compliance to the overall injury prevention programme. Methods A structured online survey was administered to the Head medical officers of 34 elite European teams currently participating in the UEFA Elite Club Injury Study. The survey had 4 sections; (1) risk factors for injury, (2) assessment and monitoring of injury risk, (3) prevention strategies and (4) coach compliance and player adherence to the injury prevention process. Results 33 (97%) Medical officers of the teams responded. The most important perceived injury risk factor was previous injury. Four of the top 6 risk factors—physical fitness, accumulated fatigue, reduced recovery time between matches and training load—were related to player workload. The top 3 preventative exercises were eccentric, balance/proprioception and core training. Regarding monitoring, the top 3 tools implemented were measurement of workload, subjective wellness and a general medical screen. The subjectively rated level of coach compliance in UEFA teams was perceived as ‘high’, while the player adherence varied from none at all to perfect. Summary and conclusion Medical officers place importance on workload-related variables as risk factors for injury in elite European football players. A lack of consistently high player adherence may limit the effects of contemporary injury prevention programmes in elite European footballers. A previous survey in professional football teams10 started the process of quantifying the injury prevention perceptions and practices of teams, but the study was limited by the heterogeneity of the playing standard of teams. Therefore, we aimed (1) to quantify current practice at the most elite level of professional club football in Europe with regard to injury prevention strategy and (2) to describe player adherence to and coach compliance with the overall injury prevention programme. The Head Medical Officers (‘medical officers’ for this paper) of the 34 professional football teams forming the UEFA Elite Club Injury Study were invited to participate in this structured survey. The UEFA Elite Club Injury Study is a research initiative operated by UEFA involving among the most elite teams in Europe with the aim of increasing the safety of players and contributing to the understanding of injury in sport (http://www.uefa.org/protecting-the-game/medical/injury-study/index.html#uefa+injury+study). The teams were selected by UEFA as being qualified among the 32 teams in the UEFA Champions League (UCL) ground-play stage for the season 2014–2015 or had participated in the play-off stage or were ranked as 1 of the 50 best teams in Europe during the period 2001–2014. The email invitations explained the purpose and procedure of the survey. The medical officers of participating teams were asked to submit their response online. If a question was unanswered, it was excluded from the analysis. Data were collected between 24 March and 30 April 2015 and medical officers were asked to base their responses according to their practices and experiences from the current 2014–2015 season. All participating medical officers were provided a ‘club code’ and also written consent to participate. All responses were confidential, and therefore team names cannot be disclosed. 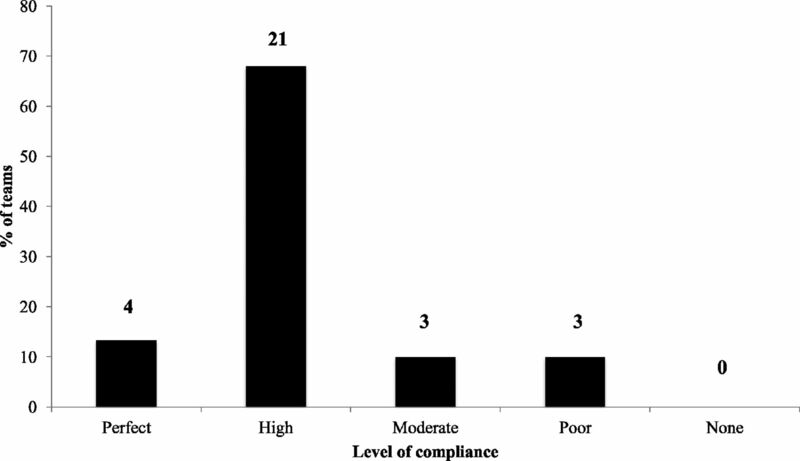 The survey was constructed in English and administered via an online survey software (Survey Monkey, http://www.surveymonkey.net) and consisted of 21 questions (19 closed and 2 open) (see online supplementary appendix A) with four sections: (1) perceived risk factors for injuries, (2) screening tests and monitoring tools used to identify injury risk, (3) injury prevention strategies utilised, perceived effectiveness and implementation strategies, (4) player adherence (defined as ‘commitment to consistently performing an injury prevention programme’) and coach compliance (defined as ‘commitment to complying with individualised player recommendations’). The questions were inspired by two previous surveys on injury prevention strategies in professional10 and international football teams.12 The design of the survey took into consideration the authors’ combined knowledge and experience of sports medicine and science in professional elite football, in addition to their work in peer-reviewed research and implementing survey-based research. The survey was pilot-tested with five elite European football team medical officers before the official invitations were sent. Since no feedback or comments were received to suggest changing any parts of the survey, no changes were made. Raw data were exported from Survey Monkey to Microsoft ‘Excel’ software and analysed independently by the research team. 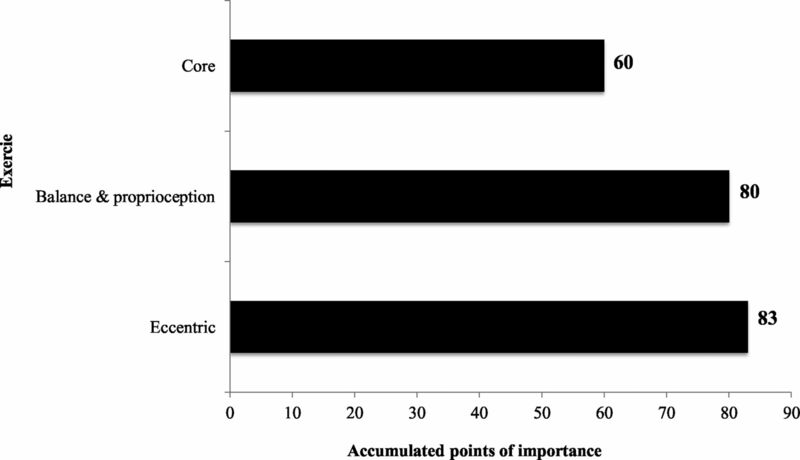 To calculate the overall importance of risk factors, points were awarded on the basis of a Likert scale of perceived levels of importance (‘very important, important, somewhat important, not important, not sure’) developed for previous survey research.10 ,12 Each time a risk factor was rated ‘very important’, it was awarded 3 points, ‘important’: 2 points, ‘somewhat important’: 1 point, ‘not sure’: 0.5 point and ‘not important’: 0 point. Points were then summed and risk factors ranked in order of highest summed points to lowest. A similar method was used to determine the ‘5 most important monitoring tools and preventative exercises’. Teams were asked to rank in order of importance (1st to 5th) (1) the monitoring tools and (2) the preventative exercises they considered the most important in their injury prevention programme. Points were awarded on the basis of a scale developed for previous survey research10 ,12; monitoring tools and exercises rated in the 1st position were given 5 points, 2nd: 4 points, 3rd: 3 points, 4th: 2 points and 5th: 1 point. Points for each monitoring tool and exercise were summed and ranked in order from highest to lowest. Regarding open-ended questions, individual responses were subjectively analysed for similarities and grouped into the appropriate overall category. Altogether, 33 (97%) of the 34 teams submitted a survey response. One of these teams (3%) submitted a partially filled survey only. Thirty-three surveys based on the perceptions and practices of the medical officers of the UEFA Elite Club teams were analysed. As based on the medical officer's perceived rating of importance, the three most important risk factors for injury are presented in table 1. Thirty-one (94%) of 33 teams confirmed undertaking testing and monitoring of their players; 27 (87%) performed this continuously throughout the preseason and in-season. Two teams (7%) did not assess their players’ individual injury risk profile. The three most commonly used injury-screening tests were (1) evaluation of side-to-side muscle imbalance (31 teams), (2) flexibility (29), (3) evaluation of peak muscle strength and assessment of joint mobility/function (both used by 28 teams). The three most important monitoring tools are presented in table 2. Thirty-one (97%) of 32 responding teams implemented an exercise-based injury prevention programme, of which 26 (84%) prescribed both team and individualised programmes. Five (16%) teams implemented individualised only prevention programmes and one team did not implement any injury prevention programme. All 32 teams implemented their injury prevention programmes on weeks with only one match; 30 teams continued to implement their programme during weeks with two matches, but with the following modifications—(1) reducing the external load (60%), (2) reducing the sets and repetitions (53%), (3) reducing the frequency (50%) and (4) modifying the exercise type (20%). Nineteen (63%) teams individualised the programme. The three most importantly rated preventative exercises used in the UEFA Elite Club teams are shown in figure 1. Top three injury prevention exercises used by the UEFA Elite Club teams. Head medical officers perceived ‘importance’ of coach compliance, player adherence and quality execution of exercises to their injury prevention practices are detailed in table 3. Figure 2 shows the level of coach compliance to the injury prevention process. The levels of (1) player adherence and (2) quality execution of exercises are presented in tables 4 and 5, respectively. Level of coach compliance in the UEFA Elite Club teams. Thirty (91%) teams responded to the two questions pertaining to challenges faced in obtaining player adherence and coach compliance. The main challenges faced are presented in table 6. Twenty-nine (88%) and 31 (91%) teams provided information on their top three strategies for maximising coach compliance and player adherence, respectively. These top three strategies are presented in figures 3 and 4, respectively. UEFA Elite Club teams’ ‘top 3’ strategies to maximise coach compliance with individualised player recommendations. UEFA Elite Club teams’ ‘top 3’ strategies to maximise player adherence to the injury prevention programme. Thirty-two (97%) teams rated the effectiveness of their injury prevention strategies. 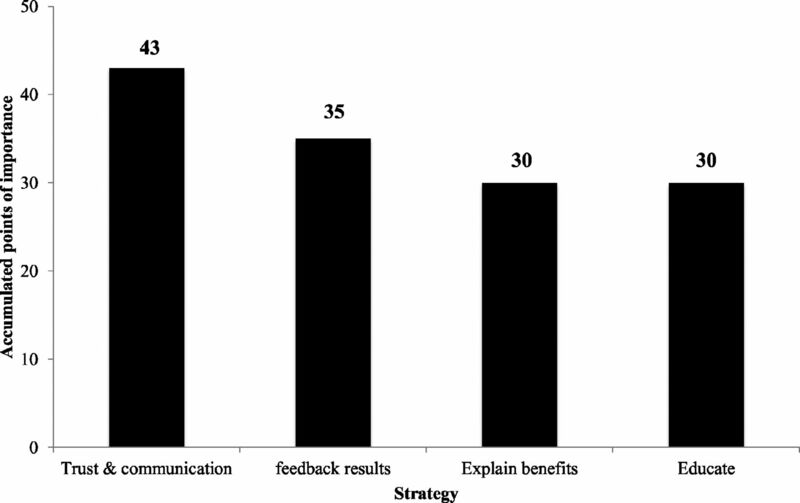 Twenty-nine (91%) teams believed that their practices were effective but conceded that they could have been better. Two (6%) believed that they could not have been better and 1 team stated that their injury prevention practices were not effective. In this survey of the medical officers of the 33 UEFA Elite Club teams regarding injury prevention, the most important perceived injury risk factor was having had a previous injury. Medical officers placed great importance on workload-related variables as risk factors. Coach self-reported compliance of the UEFA Elite Club teams with individualised player recommendation was generally high. However, the medical officers’ responses showed that players’ adherence to the injury prevention programme and quality execution of exercises was varied. Similar to two other injury prevention surveys, one in professional premier league clubs from around the world10 and the other in top-level international football players,12 and in line with high-level evidence,8the most important perceived risk factor for injury in the UEFA Elite Club players is previous injury. Improvements in controlled rehabilitation with functional tests before returning to team training and match-play may minimise the risk of incurring another injury.13 Of interest to practitioners may be a proposed method that allows (1) a player’s rehabilitation to be continuously reviewed, (2) a rating of success of different rehabilitation strategies and (3) provides the medical team with transparent auditable evidence of whether a player is fit to return to play.13 The method consists of using a six-point subjective quality rating of their performance during the various rehabilitation exercises and stages; 0—player unable to continue, 1—poor; 2—moderate, 3—good, 4—very good, 5—excellent (equated to the players’ benchmark standard when uninjured. Only when a player’s score on the prescribed exercises meets the desired quality should they progress to the next stage. Four of the combined top three intrinsic and extrinsic risk factors were related to the workload (ie, physical and mental loads) placed on players from training and match-play: accumulated fatigue throughout a season/congested match period (third intrinsic), reduced recovery time between matches and training load (top 2 extrinsic), while the second most important intrinsic risk factor (physical fitness) can arguably incorporate a player’s ability to cope with periods of high workload. Congested match periods with reduced recovery time are a significant risk factor in elite European teams.14 ,15 With the exception of congested match fixtures/reduced recovery time between matches, most workload-related variables (eg, training load, physical fitness) require validation as a risk factor in the elite football population. A review of workload and injury16 highlights that workload both external (the stimulus) and internal (the response) are associated with increased injury risk/rates in various other elite sports including Australian Rules Football, Rugby League, Rugby Union, cricket and baseball (though not yet demonstrated in elite football). Owing to these findings in other elite sports combined with both the high perceived importance of workload as a risk factor in elite football and the emphasis on monitoring of these workloads as evidenced in this survey, future studies are imperative to validate (or refute) this as a risk factor in this population. The highest ranking (first) monitoring tool for the UEFA Elite Club teams was measurement of workload (ie, from training and match-play). This is consistent with the practitioners’ perceptions that workload-related variables are key risk factors for injury. Subjective wellness was rated the second most important monitoring tool of the UEFA Elite Club teams. Assessing players’ perceived fatigue was the most commonly measured variable. Other characteristics that teams measured included muscle soreness, perceived recovery and sleep quality. Subjective ratings of wellness are reported to be a useful tool to monitor the adaptive responses to the rigorous demands of training, competition and life of the professional athlete.24 Although the level of scientific evidence for subjective wellness measures remains low in elite football players, one study found that subjectively stress-related scales of fatigue, disturbed breaks and sleep derived from the Recovery-Stress Questionnaire for Athletes (REST-Q) predicted injuries in the month after the assessment.25This scale may provide teams with a method that is validated and potentially predicts injury to measure players’ balance between recovery and stress, while research further validates (or refutes) and provides evidence-based recommendations for its, interpretation. Top preventative exercises, but how effective are they? Coach compliance with individualised player recommendations was rated by the UEFA Elite Club medical officers as being either ‘essential’ (56%) or ‘very important’ (41%). The level of compliance reported by coaches from the UEFA Elite Club teams was generally high with 61% of teams rating a ‘high’ compliance and 19% with a ‘perfect’ compliance (80% combined). Despite this overall high compliance from UEFA coaches, the injury rates have not reduced, suggesting that there may be other factors that are contributing to this lack of injury reduction. Player adherence to an injury prevention programme may influence the rate of injuries.11 ,26 Our study revealed that the UEFA Elite Club teams believe ‘player adherence’ to an injury prevention programme is either ‘essential’ (53%) or ‘very important’ (44%) to reduce injury occurrence. Additionally, a similar pattern was reported for the quality execution of exercises contained in the injury prevention programme in achieving the desired adaptations, 59% of teams noting that this is essential and 34% highlighting this as very important. The level of player adherence to the injury prevention programmes of the UEFA Elite Club teams in this study was varied. Only four teams specified having a perfect adherence from all players, while six stated having a perfect adherence from around 50–80% of players and seven teams had perfect compliance from less than 50% of their squad. However, 17 teams also stated that they had either ‘low’ or ‘no adherence’ in up to 50% of their squads. The quality execution of exercises among the squads of teams followed a similar varied pattern. If indeed player adherence and quality execution are at the least ‘very important’ components for an effective injury prevention programme, this may also explain the absence of reduction overall in injuries despite most clubs regularly implementing a preventative exercise programme. The main challenges to adherence of the injury prevention programme were the concern of players at experiencing ‘sore muscles’ (50%), ‘heavy (tired) legs’ (44%), as well as a perception that the exercises will not prevent injuries (38%) and that in fact some exercises were perceived to ‘increase the risk of injury’ (22%). Although teams implemented strategies to offset and reduce these worries of players, (top three—education, trust and communication and coach backing/attendance at sessions), it is apparent that while these may have been somewhat effective in obtaining a certain level of adherence and quality of execution from some players, there remain some players who are not convinced or wary of such exercise protocols. Future research is encouraged to determine if in fact coach compliance and/or player adherence are linked to the prevention of injuries in elite footballers so that the information can be used to educate players. Additionally, survey research conducted in elite players may open some interesting insights into the gulf that exists between evidence, practice and players’ understanding of injury prevention and ultimately their ‘buy in’ to the overall process. We acknowledge that the responses to our survey correspond to the perceptions and experiences of the medical officers, and it is possible that the responses could vary according to the position surveyed, for example, fitness coach, physiotherapist, etc. However, please note that injury prevention in elite European clubs involves a collaborative approach of various professionals. Our survey also does not tell us how much contact the medical officers had with the on-field prevention programme on a day-to-day basis. This may have varied according to the team. Finally, there was no objective measure of the precise level of player adherence and quality execution of programmes; instead, this was a subjective response of the medical officers’ experience. In conclusion, the present survey of medical officers has highlighted in particular the highly perceived importance of workload-related variables for injury risk of the UEFA Elite Club football players as well as methods to measure these workloads and how players are coping. Although injury prevention exercise programmes are implemented routinely in most of the UEFA Elite Club teams, the adherence and quality of execution by players may limit the effect of such programmes on injury rates. Coach compliance is highly rated to influence the effects of the individualised injury prevention recommendations of players; however, encouragingly, the reported compliance of the UEFA Elite Club team coaches was generally high. Future research needs to focus in particular on the consequences associated with previous injury and what interventions can reverse or reduce the negative consequences. Validation of workload in this population is imperative along with evidence-based guidelines of how to most effectively monitor to influence decision-making in practice. Also, research into the role of internal communication in injury occurrence and how to maximise this aspect is highly recommended. Finally, aspects related to player adherence and quality execution of exercises and outcome on injury occurrence must be determined as well as strategies to maximise these elements in players. Head medical officers of elite European football teams perceived previous injury as the most important risk factor for a new injury. Workload is considered of great importance as a risk factor for injury by the Medical staff of elite European teams. Coach compliance in elite European teams is high. Player adherence to preventive exercises is low and may limit the effects of injury prevention programmes. The authors would like to thank the Head medical officers from the 33 participating teams for taking the time to complete and return the online survey.
. Increased risk of knee injuries and osteoarthritis in the non-dominant leg of former professional football players. Wien Klin Wochenschr 2010;122:40–3.
. GPS and injury in professional soccer. J Strength Cond Res 2015. Published online first: 11 Jul 2015.
. Recovery-stress balance and injury risk in professional football players: a prospective study. J Sports Sci Med 2015;33:2140–8. Contributors AMcC, GD and JE came up with the idea for the survey. AMcC, GD and JE created the initial draft of the survey. JE piloted the survey. AMcC, GD and JE prepared the final draft. JE sent out the survey and followed up clubs for completed surveys. AMcC analysed initial results. AMcC, JE and GD agreed on final analysis and results. AMcC prepared first draft manuscript. JE and GD provided feedback and revised manuscript. AMcC made necessary changes and submitted the manuscript. All authors contributed to reviewer comments response and revised manuscript. AMcC resubmitted the manuscript.